We require a $1000.00 non-refundable tour deposit to secure you in your desired ride date. The balance is due in full 45 days prior to the departure date. January thru May has prime riding conditions so these dates tend to book faster than our busy season of October through December. Refunds: No refunds if cancelled 30 days or less from desired ride date. Run solo or bring your posse! Go Baja Riding’s courteous and experienced crew will meet you with our transport vehicles for pick up at the Holiday Inn-Old Town at 11am. Now sit back, relax and enjoy the beautiful Baja Pacific Coast as we take the scenic 68 mile ride down to the seaside town of Ensenada where the crew of Baja Riding will check you into our hotel. Relax by the pool or sightsee and shop. We will meet up for a fresh seafood or steak dinner at one of Ensenada’s finest and most popular dinner nightspots. Bruce and his crew are personal friends with the owner, so great fun and personal service is always guaranteed. After dinner, consider visiting “one of the other local hotspots or turn in early to prepare for our big ride the next morning. Secure your adventure date now! Let's ride – After an early breakfast and riders meeting we’ll ride south, enjoying mountains, beautiful pine forests, fresh mountain stream crossings, old missions, and some of the best single track off road riding on the planet. 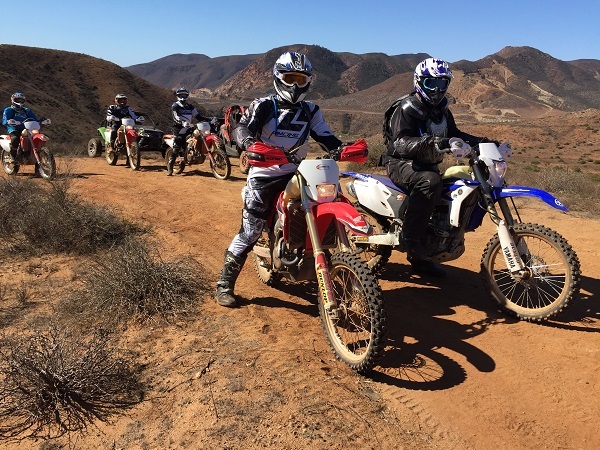 Our trailside lunch will be along the famous Baja 1000 race course! Then it’s across the challenging Diablo dry lakebed and through the beautiful desert and mountain ranges above San Felipe, a small fishing town on the Sea of Cortez. By now you are ready to relax by the pool of our beachfront hotel, enjoy ice-cold cerveza, or just sightsee along this beautiful fishing village. Later, enjoy the freshest seafood/steak or traditional Mexican food in Baja. World class adventures & service. On to Mike’s Sky Ranch – We can arrive early and relax by the pool, or add some extra challenging miles to “make your day”. Mike’s Sky Ranch sits in the mountains above the small farm town of Valle De Trinidad on the Baja race course. This quaint, secluded pueblo has been a favorite stop for many famous Baja racers and celebrities. It features fresh ranch style steak dinners, racers’ bar and pool, and clean comfortable rooms. Mike Sr., a famous Baja competitor, started this hotel decades ago and it has grown in popularity as a place to see in Baja. Now the tradition of great food, drink and hospitality continues on with “Mike Jr.” continuing his father's legacy, it is a legendary Baja experience. By now the stories will be flowing, and you will be having a great time. Next AM a fresh breakfast will fuel you up for another adventurous day. Your most exciting challenge ever! The riding today is considered by many to be the most beautiful and challenging of all. You will trek out of Mike’s Sky Ranch to the Pacific Ocean. A catered lunch on the trail will be a welcomed break. Then it’s up the coast with the spray from the ocean waves keeping you cool! Once you experience the beautiful sandy beaches, you will want to return time and time again. Our adventure desert tour concludes in Ensenada with transportation back to San Diego for the evening at the Holiday Inn-Old Town. * Typically Starts with a Friday – Holiday Inn Hotel pickup at 11AM and ends on Monday Evening with Return to the Holiday Inn Old Town.